What is the purpose of a policy statement? A health and safety policy is one of the primary documents that all organisations should have in place. Well-written and designed policy statements are general - and frequent revision is unnecessary. 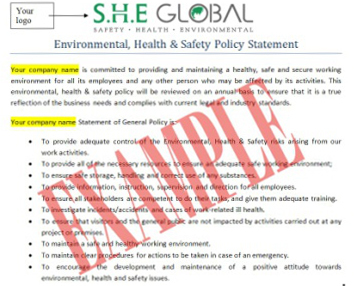 Unlike policy documents and standard operating procedures, statements are usually one-page documents visible on office walls. They set out your health and safety objectives, responsibilities and arrangements, and direct your health and safety resources and delivery. Having a good health and safety policy delivers many benefits, including clear communication of your health and safety management. It is also a legal requirement if you employ 5 or more individuals. Regulation 2 (3) of the Health and Safety at Work etc. Act 1974 requires employers to prepare, and maintain up-to-date, a statement showing the policy on safety and the organisation and arrangements put in place to ensure the general policy is carried out. The employer must ensure that all employees are aware of the policy and any revision made to it. Regulation 5 of the Management of Health and Safety at Work Regulations 1999 makes reference to the need for the establishment and effect of the health and safety policy within the organisation as a document and as an important guide to the risk assessment process. The Policy Statements we offer (listed below), fall into that category, but must be specific to your company to be legally displayed. After purchase, you'll be able to download an editable Word document to insert your company details and logo.